Discussion in 'WWII General' started by Dylan Haney, Apr 13, 2019 at 2:27 PM. I recently got back my great-grandfather's final pay records, and was wondering if anyone could give me any information from them. I've been trying to figure out his unit, but I've had no luck. He served in Europe during the war. The pay record from Fort Ord was just before he reenlisted there for a year-long enlistment. Other than that, I'm having trouble getting useful information from the three different pay records other than him being overseas for what I assume were occupational duty in Japan. I know you guys are more the experts than I am, so I thought I'd try here. If there's any information at all that could set me in the right direction, I'd be grateful. I've tried the County Clerk, but for some reason, they have all his brothers' records, but not his. Try contacting the local county clerk in WVa where he is from and see if they have any records for him.Veterans were encouraged to file discharge papers with their county clerk.Check the VA to see if he availed himself of any of their services,they may have records.Local newspapers were good about reporting on the local boys.Check their archives for draft,enlistment and deployments for your grandfather. Keep digging! It is not all on the internet. Do not expect instant gratification. The knowledge you gain will be cherished. I've contacted dozens of family members, great aunts and uncles, and even my great grandfather's brother. I got a photograph in his uniform from him, but no helpful information. The local County Clerk has his brothers' records, but not his for some reason. 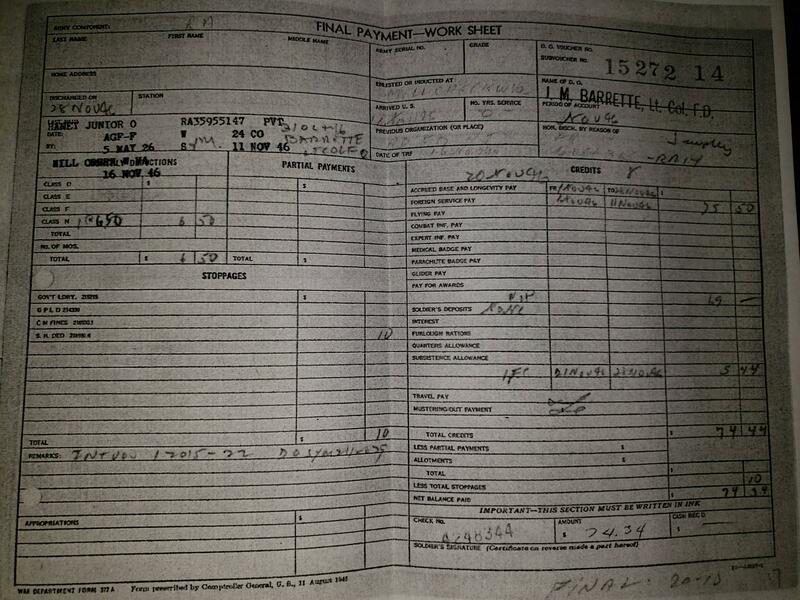 The National Archives informed me that his records were burnt in the fire, so I got these final pay records instead. His funeral had full military honors, so I suppose my next step is to check with the veteran organizations he was with. He was last paid before reenlisting in Nov of 45 by JS Peeples Maj FD. Maybe that'd help me figure some things out. Does anyone know anything about Maj. Peeples? Also, what is the FD? FD was the Us Army Finance Department. People's was simply the officer signining off on his paperwork. Ah, I see! Back to square one. I use a trusted researcher,Geoff at Golden Arrow Research,he has a good web site and is not to expensive and has found info on my relatives. This maybe a way to go if all else fails. I was considering Golden Arrow Research, but when I contacted them I was told it'd be 250-300 dollars. So I am saving it for a last resort. HE got busted from PFC Private First Class) to PVT Private) on 04 Oct. 1946 and had to forfeit $3.20. My main goal is to find anything that could help me identify which division and regiment he was in during his time in Europe. Learning that his previous location was Fort Dix, I was excited at first... But then I realized that it doesn't really narrow it down too much at all. Looks like he didn't enlist until November 1945. I have his draft card and his reenlistment at Fort Ord as a PFC in November of 1945. 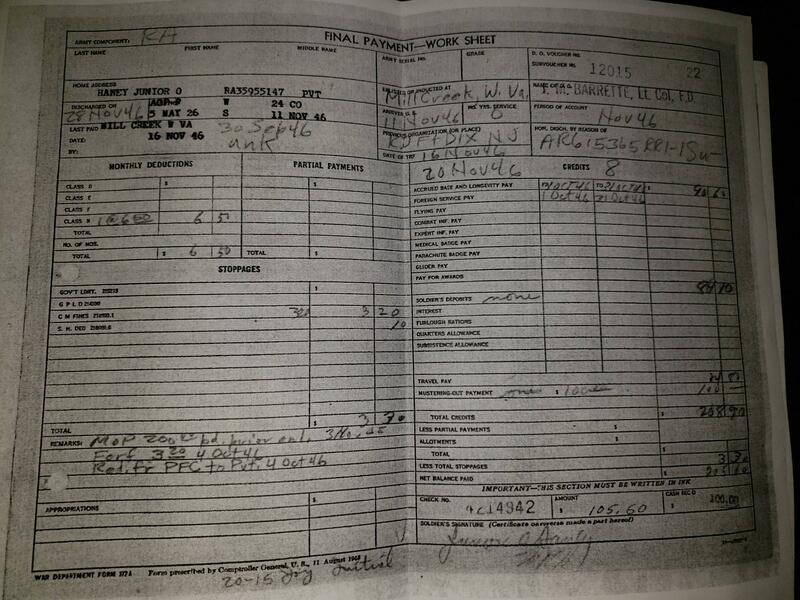 As you can see from his final pay voucher, he originally enlisted in Huntington, West Virginia. From what I know, he saw combat in Germany. Kind of hard to have seen combat against Germany since the war in Europe was over in May 1945. You said reenlistment in Nov 1945. Do you know his original enlistment date? Fold3 only gives the November date. Yes, I understand that. I don't know his original enlistment date. But it's clear that he enlisted previously as it's listed twice on his final pay records (on the remarks of one and the 'enlisted or inducted at' section of another). I believe it's entirely possible that he saw action in the Ruhr Pocket (or even in earlier operations) in April of 1945. That's nearly a year from his draft registration. 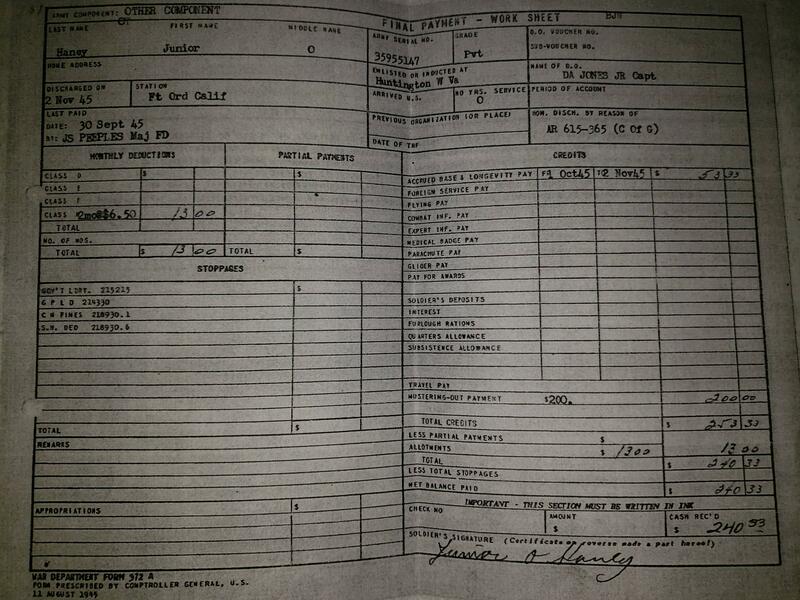 You can see on the first pay record that he was discharged on Nov 2, 1945, and reenlisted a day later as shown in the Fort Ord enlistment record. Can you contact the funeral home? In my father's case, they required a copy of his separation papers to get his flag for the coffin. Maybe they have a copy? Forgive me if this has already been addressed. I just woke up. Fold3 would have gotten the enlistment date from the NARA Electronic Enlistment database. The database usually shows the reenlistment data rather than the original enlistment data. His ASN begins with a 3 which suggests he was drafted. With a DOB of 31 May 1926, he would have been 18 in June 1944. If he was drafted around that time, it is likely that he went through basic training and was then sent to Europe through the Army Replacement System. Regarding Golden Arrow, Geoff is very fair. The price quote you received was on the high end. When I have had him do work for me, he did adjust the price down depending on the circumstances. Indeed Tommy, he separated from the AUS and reenlisted RA. NARA only tracks his RA re-enlistment, which indicates to me he may have been issued a new ASN? Hm, good idea! I'll definitely check with the funeral home. I'll do anything that'll get me closer to knowing! I do wonder why the County Clerk doesn't have his records, but has all of his brothers'. It is odd that in 1945 they say he was originally inducted at Huntington, then in 1946 it becomes Mill Creek. Anyway, he was discharged from the AUS on 2 November 1945 at Fort Ord, with zero years of service and no foreign service. Discharge was for Convenience of the Government...in other words to allow him to re-enlist in the RA. We next find him being discharged again on 28 November 1946, after returning to the U.S. via Fort Dix on 11 November 1946, then being transferred to Mill Creek on 16 November 1946, where he received a payment on 16 November and then his final payment on 28 November. He still had not accumulated a full year of service, although he had served overseas for at least two months, from 1 October to 11 November 1946. He may have lost time in service due to whatever he did that got him busted from PFC to Pvt. His discharge was under AR 615 - 365 RR 1-1 Demobilization. Frankly, I doubt he served in Europe during the war, but rather only postwar. He would be entitled to the Army of Occupation, Germany medal. I disagree with your evaluation. His previous organization or place was Fort Dix, New Jersey. Fort Dix was used for training many divisions to be sent overseas to Europe, correct? After the war in Europe ended, weren't troops sent for training for the upcoming invasion of Japan? I believe that's why he ended up in California of all places. The fact that he was in California leads me to believe that he took part in the occupation of Japan rather than Europe. Ships carrying troops to Japan left from the west coast. As for Mill Creek being listed instead of Huntington, it could've been a mistake. Mill Creek is my home town, and his home town as well. Huntington and Clarksburg were where men enlisted during the war. Mill Creek is just a small town of a couple hundred people. Wouldn't his years of service increase to at least one from his reenlistment in November of 1945 to November of 1946? It just stays at 0. That's why I believe that to be just a mistake as well. And while it may not be useful evidence, I have heard stories of his combat in Germany through the few people that he talked about it with. Can anyone help me figure out what "AGF-F W 24 CO" means?